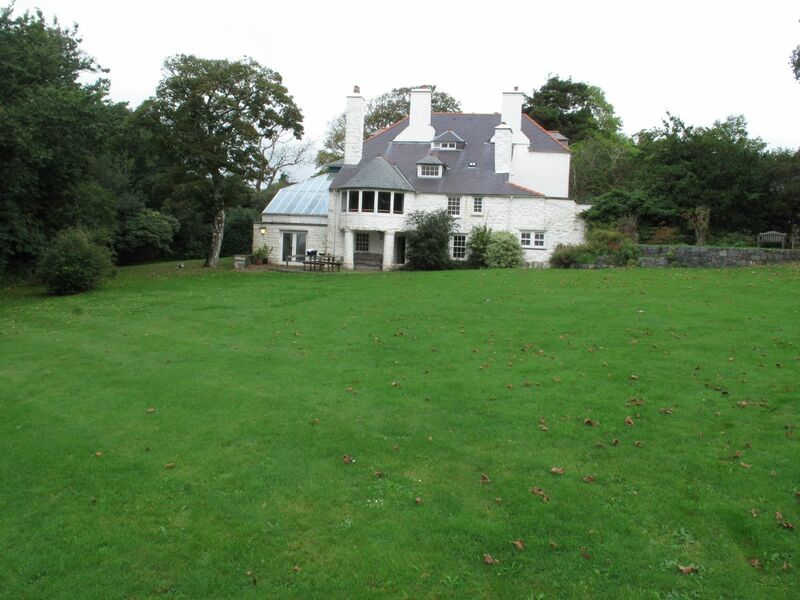 Here are the front (pic: below) and back (above) of Ty Newydd, the National Writers’ Centre of Wales, where I have taught nature writing for five years. Some years we have had gaps (2008) and last year the course was taught by others (Katrina Porteous and Nigel Brown), but it has a tradition running back to 2007.
the nature writers do go out into the surrounding landscape in search on inspiration and for several years, under the guidance of Nigel Brown, we have visited the tip of the Lleyn peninsula, which extends as a narrow granite finger to bound the northern edge of Cardigan Bay. 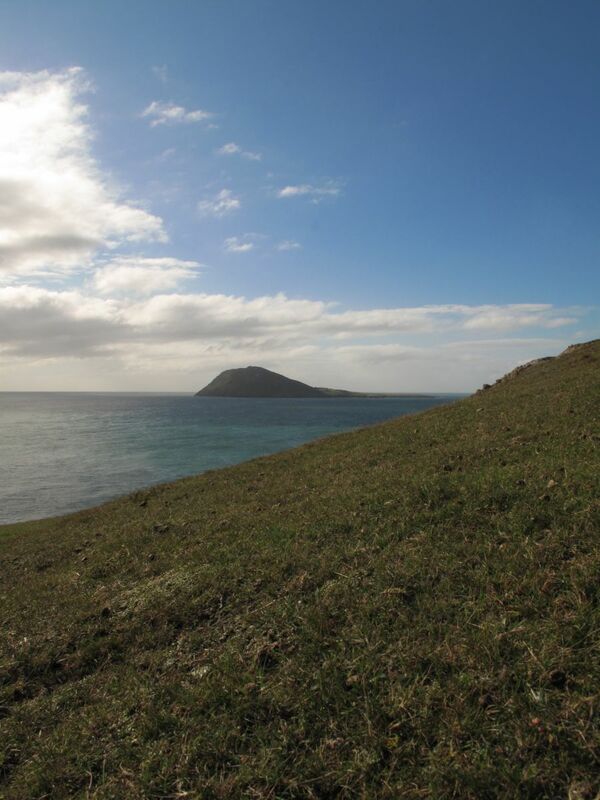 Westwards from the tip is also the ancient pilgrimage site of Bardsey or Ynys Enlli, the ornithologically famous island just across the sound. One bird known from there and from the headland is red-billed chough. We have seen this regional speciality on every visit. However a key part of our visits to the Lleyn are the plants, lichens and fungi, which depending on season, are conspicuous. This year we enjoyed the expertise of Ray Woods, who is one of the region’s foremost experts on lower plants, especially lichens, and fungi. 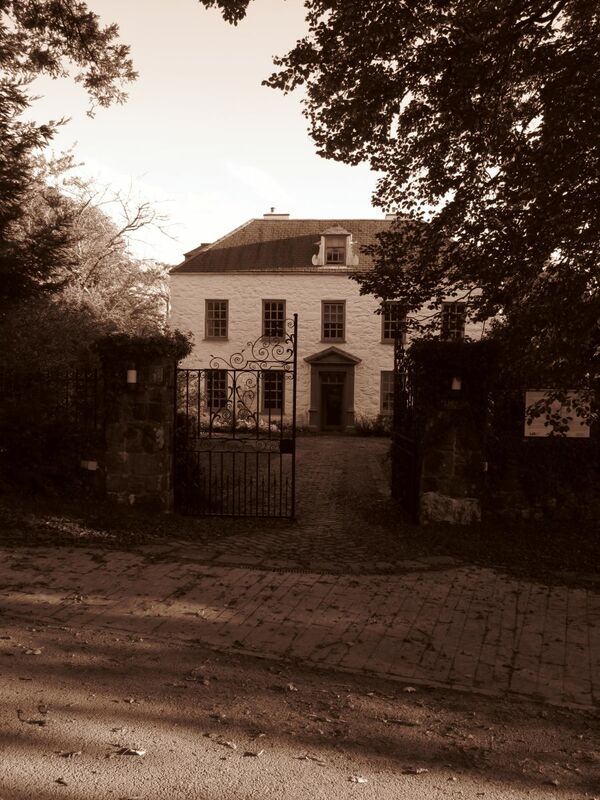 In most years at Ty Newydd we have the unparalleled teaching abilities of Nigel Wood from Bangor University and the associated Treborth Gardens, one of the most gifted imparters of natural historical information I have ever come across. Nigel is a an all-round scientist with a poet’s soul. 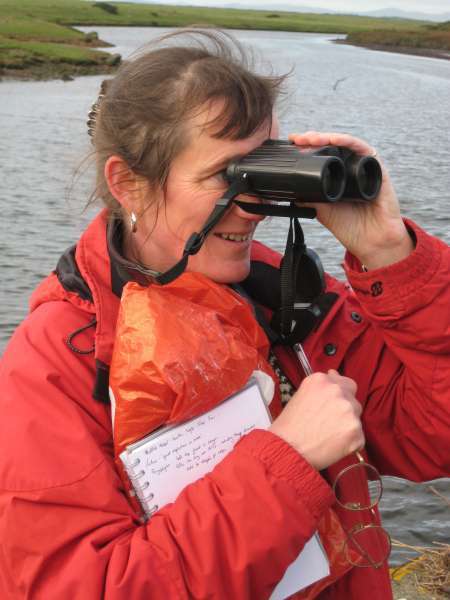 Here for good measure is the other tutor who has made the Ty Newydd nature course such wonderful fun, the immensely modest and completely brilliant Katrina Porteous. Even in years when she is not teaching I usually have several sessions with Katrina’s poetry. This time I even had a recording of her reading her major piece The Wund an’ the Wetter (I love it so much and her reading of it that I have ‘made’ her read it for me twice in public fora now). But all of her work is full of minutely observed experiences of nature. Occasionally, however, minute observation has its bizarre side. Here is the group last week inspecting Ray’s finds on one lump of granite. For those unfamiliar with lower organisms this was a case of examining crab’s eye lichen Ochrolechia parella. Yet there is surely a funnier caption in this image than that! 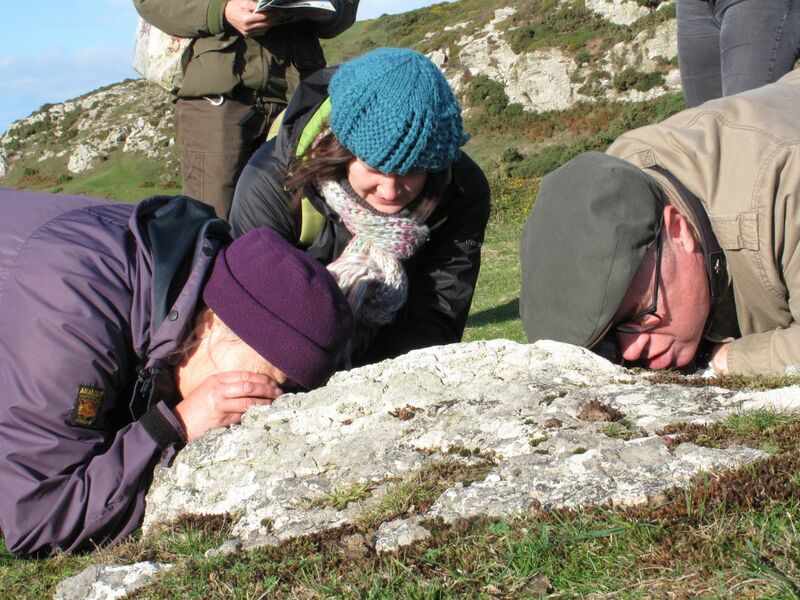 Which other writing course could get a university professor (Derek on the right) or a distinguished novelist (Sarah in the middle) cheek by jowl with a half-billion year old rock? Another regular feature is our nightly moth trap. 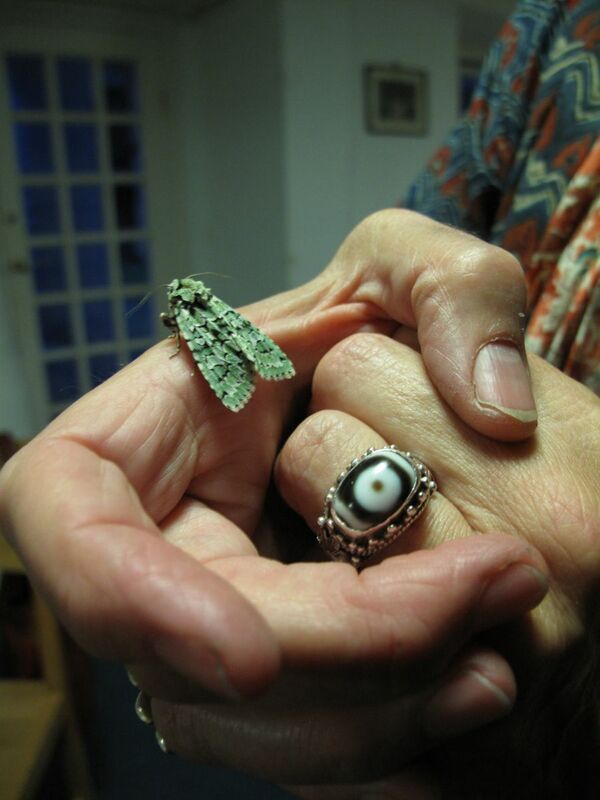 During autumn visits we normally catch of the most beautiful of all British moths, the merveille du jour. It so captivated one of our guest speakers, Ruth Padel, that she momentarily wore this glorious creature like one of her exotic rings. This particular moth ended up in the twittersphere! (Please note Ruth’s other jewellery item called a ‘tear of Shiva’. The quality of our guest speakers has been exceptionally high but also hugely varied. Ruth is a favourite partly for her wonderful readings, but also the mixture of forensic scientific detail and poetic lyricism in works such as Tigers in Red Weather. Another year we had the brilliant Jim Crace, whose own unique take on natural history is a major and powerful part of the novels, such as Being Dead and The Gift of Stone. Last and very far from least was the time we were visited by Redmond O’Hanlon, who blends a late-eighteenth century passion for all things living, especially for birds, mammals and fishes, with a comedic genius. 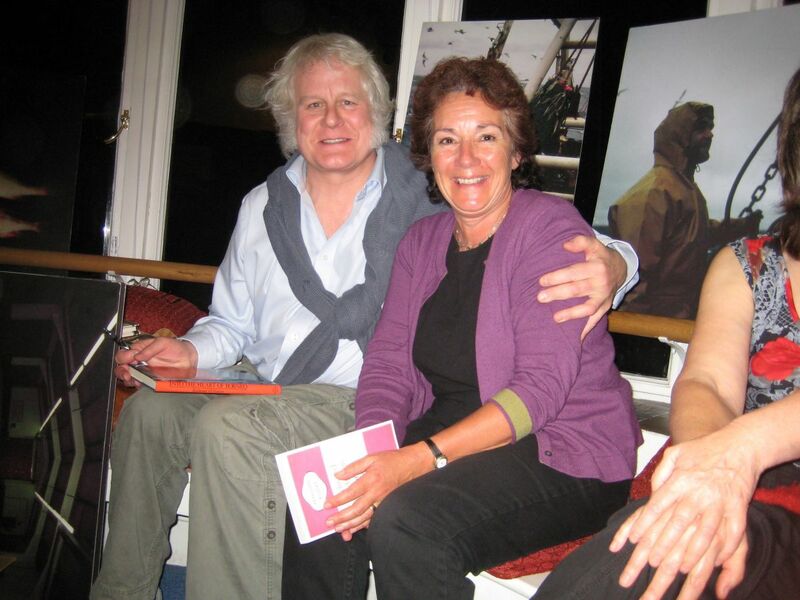 In 2007 Redmond read in Orcadian dialect to give authenticity to the dialogue in his wonderful book Trawler. His charm and generosity swept all before him, including the former centre head Sally Baker, who presided over Ty Newydd and nourished the nature course for all the years that it has featured in the programme. Wonderful times.